Let us bring Ristorante Rocca to you. Let the famous Ristorante Rocca cuisine come to your office or home. Catering is available for any type of occasion whether it’s a business lunch, family party, cocktail party or any special event. Ristorante Rocca menu offers a wide range of menus items including: appetizers, salads, sandwiches, entrees and pastas. We can accommodate any guests requests of special dietary needs. Bay Area Catering Services, by Ristorante Rocca, is an excellent caterer choice for your next business event. Servicing Burlingame, San Mateo, South City, Peninsula, San Jose and surrounding areas. We provide complete menu solutions that make pick up incredibly easy. “Working” lunches will never be the same! Our excellent Italian influenced with California dishes are presented buffet style. Any Questions? Please call us. Easy “Drop-off” Catering – Delicious Food – On-Time Service! Baby greens, cherry tomatoes, carrots, tossed with creamy Italian dressing. Romaine hearts, garlic croutons, shaved grana padano cheese, classic Caesar dressing. Butter lettuce, apples, golden raisins, candied walnuts, gorgonzola vinaigrette. Seasonal greens, caramelized walnuts, cherry tomatoes, crumbled blue cheese, raspberry vinaigrette. Layered mozzarella, tomato slices, fresh basil. with Porcini, Proscuitto, Grana, Sauce Pizzaiola. Grilled Crostini, with marinated roma tomatoes, fresh basil, garlic, olive oil, shaved grana padano cheese. Oven baked eggplant rolls stuffed with ricotta cheese, roasted garlic with marinara & touch of cream sauce. Grilled Italian lean sausage, fresh tomato, red onion, provolone cheese. Grilled chicken, roasted bell peppers, arugula. Grilled eggplant, zucchini, bell pepper, mushrooms, mozzarella cheese and artichokes. Skirt steak, onions, roasted bell peppers, mushrooms. Meat-stuffed pasta, pancetta, peas, mushroom, savory cream sauce. Pasta, chicken, broccoli, tomato, garlic white wine. Spaghetti pasta with meat sauce. Fresh Italian sausage sautéed with red onion, bell pepper, mushrooms, fresh tomato marinara sauce. Rigatoni pasta with chicken, mushroom, green peas, with a garlic cream and marinara sauce. Breaded sautéed breast of chicken with malted mozzarella cheese and marinara sauce with spaghetti pasta. Sautéed chicken breast, mushroom marsala wine sauce, served with mashed potatoes and garlic mashed potatoes. Grilled fresh Salmon with capers, olives, tomatoes, lemon shallot sauce served over rice and vegetables. 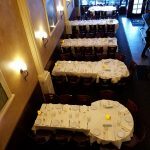 We look forward to serving your next event!